From 220 miles above Earth on the International Space Station, American astronaut Ron Garan certainly has a unique perspective of our home planet. Garan, a NASA spaceflyer on his second spaceflight, is the creator of the blog Fragile Oasis, which he launched before leaving Earth as a way to share his experiences (and the experiences of other astronauts) to inspire people to cherish the beauty and wonder of the Earth. After all, only a select few get the chance to fly in space. The blog posts and photos afford readers a glimpse of life on the massive orbiting outpost, and by shining a light on Earth from space, Garan and his colleagues hope to mobilize people to improve the conditions on our fragile planet. Garan also sends photos to Earth via Twitter, where he posts updates on his flight as @Astro_Ron. "It was absolutely incredible to see this enormous space station, the most complex structure ever built," Garan wrote. "Built by 16 diverse nations, all working together, to accomplish this tremendous achievement in orbit. To see this magnificent accomplishment of humanity against the backdrop of the indescribably beautiful Earth 250 miles below was breathtaking. 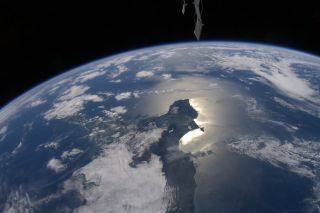 At this moment I wasn't just looking down at the Earth but I was looking at a planet hanging in the blackness of space." "It was a very moving experience to see the absolute beauty of the planetwe have been given. But as I looked down at this indescribably beautiful, fragile oasis, this island that has been given to us and has protected all life from the harshness of space, I couldn't help but to also think of all the inequity that exists on our fragile oasis." "This experience reaffirmed a belief that I held long before flying in space, that is, each and every one of us on this planet has the responsibility to leave it a little better than we found it," Garan wrote. Other participating bloggers on Fragile Oasis include veteran astronauts Douglas Wheelock, Nicole Stott and Don Pettit. Each has been a member of space shuttle missions as well as long-duration stays aboard the space station. Garan and two cosmonauts, Andrey Borisenko and Alexander Samokutyaev, launched toward the station on April 4from the Baikonur Cosmodrome in Kazakhstan. To celebrate the 41st anniversary of Earth Day tomorrow, NASA is conducting a series of online activities, including a video contest and webchats with Earth scientists.